This Ongoing War: A Blog: 01-Jun-15: What's in a name? 01-Jun-15: What's in a name? A friend pointed us to a slightly surprising, but smart-sounding, op ed that appeared in a major Arab news publication yesterday. 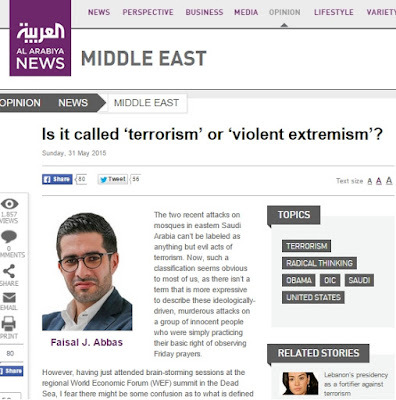 He emailed it to us with the subject line "Arab journalist asks why we can't call terrorism terrorism". Great question. The two recent attacks on mosques in eastern Saudi Arabia can’t be labeled as anything but evil acts of terrorism. Now, such a classification seems obvious to most of us, as there isn’t a term that is more expressive to describe these ideologically-driven, murderous attacks on a group of innocent people who were simply practicing their basic right of observing Friday prayers. However, having just attended brain-storming sessions at the regional World Economic Forum (WEF) summit in the Dead Sea, I fear there might be some confusion as to what is defined as terrorism and what isn’t. We agree. It's concerns like those that get us to blog here every day. We outlined our concerns ["18-Feb-15: Countering Vacuous Euphemisms" and "27-Feb-15: CVE revisited"] some months back. We felt, though, that his seriousness warranted some prior validating. We get exposed to too many voices from the Arab world complaining that too often terrorism is not being called what it really is. But then too often it turns out they actually mean something very different from what we do when they say "terror". Jordan's parliament is a good instance. It approved an amendment to the Kingdom's anti-terror legislation in December 2013 to exclude what it termed "resistance actions" against one specific party - Israel - from the jurisdiction of its State Security Court and from its law against terror. As the Jordan Times put it. the legislators "agreed that any actions against Israel cannot be "terrorism" at all" by definition. In the search bar at the top of the page, we entered the name of the woman who engineered the terrorist massacre in which our fifteen year-old daughter Malki was murdered. If anyone's a terrorist, that person is. It's a matter of public record that she confessed to all the terrorism charges at her trial, and has spoken on YouTube and many other public places dozens of times, explaining that the killings she engineered were done in the name of Hamas for ideological reasons. Not only that but she says proudly, smiling as she does so, that she went looking for religious Jewish children that day, and that she has never had any regrets. Entering her name in the search bar got us four hits. (You can check by clicking here.) We visited each link and counted up the total number of times the string "terror" appeared in the article. Here are the results. The one time 'terror' does appear in the four articles is when an Israeli terror-victim organization opposed to the Shalit deal is quoted and named. The Shalit deal is the act of extortion in which 1,027 killers and other terrorists, our daughter's murderer among them, walked free. But murderous attacks on a group of innocent people, most of them children simply practicing their basic right of buying lunch in a pizzeria, are not terror? And if they are terror (and we of course all know perfectly well they are) even though those innocent victims are Jewish, Israeli and/or Zionist, why does Al Arabiya English call the murderer a prisoner, a Jordanian, in fact almost anything but a terrorist? Why are the crimes of terrorism to which she proudly confessed never mentioned? But irrelevant and euphemistic descriptors are? Please be in touch [email us at thisongoingwar@gmail.com] and let's start a dialogue.